I know most of you have heard stories about people running their cars on "wood" back during World War II. Well... the stories are true. There was a shortage of petroleum back then and a lot of people and industries built and used wood gas (syngas) generators to power their cars, generate electricity, provide transportation, and run their businesses. 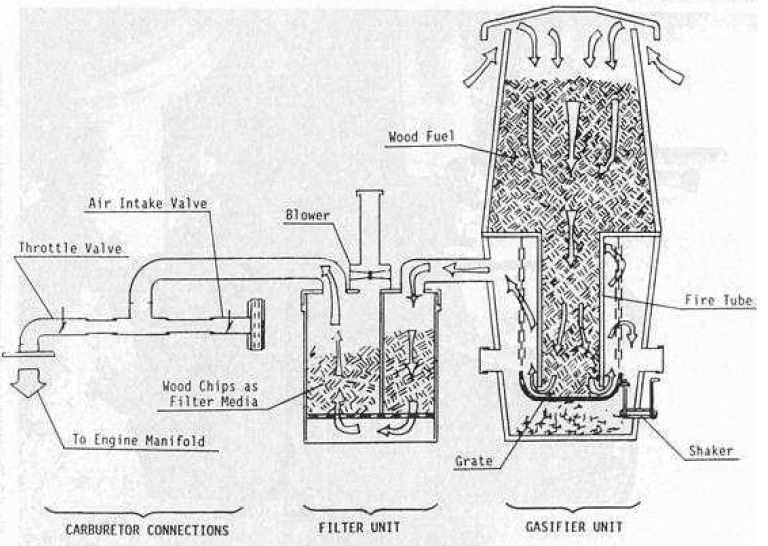 In occupied Denmark during World War II, 95% of all mobile farm machinery, tractors, trucks, stationary engines, and fishing and ferry boats were powered by wood gas generator units. In light of the Gulf oil spill and the fact that I think the government is keeping gas prices artificially low, this information may come in handy over the next few years. I still think the s*#@ has not hit the fan yet - there are bigger problems on the horizon for the USA like the commercial real estate bubble and the national debt crisis. Not to mention any one of a dozen ways that I have already outlined in previous newsletters that could bring this Country to it's knees. So... just exactly what is wood gas? It's basically a gas produced when you burn stuff like wood, wood chips, paper, corn cobs, coal, etc in a low oxygen environment. As you can imagine, waste products like corn cobs, wood chips, and the ever more popular fuel these days - wood pellets - can be used to make wood gas. All of these solid fuels are composed primarily of carbon with varying amounts of hydrogen, oxygen, and impurities, such as sulfur, ash, and moisture. Thus, the aim of gasification is the almost complete transformation of these constituents into gaseous form so that only the ashes and inert materials remain. What can you do with wood gas? Well.. the most obvious application is to run any carbureted internal combustion engine (ICE). It can be a car, tractor, truck, or even a generator. As a matter of fact, it's the same exact setup I describe in "Electricity - Make it, Don't Buy it" but with a different fuel source - syngas instead of gas or diesel or biodiesel. Check the book out if you want to learn how to set the system up where you can get power 24 hours a day and only run your generator 1-2 hours a day.